This game was meant to be a practice for Eastern Barbarian before a local event. Unfortunately, the tournament was cancelled but on the bright side we had another great game on Universal Battle. EB does not have his Varangur ready to play with in the events, so he decided to take his trusty Dwarfs. I must say I really like his new idea for an army and he also is going to have some great models to be included. Can't wait to see them painted and maybe one day we will play with real miniatures too! 2 x 20 Rangers - As I have already mentioned, very flexible units. On one hand they have good ranged attacks and with Vanguard and Pathfinder can move into some good defensive position very quickly. The same Pathfinder will help them to be more aggressive on advance too and CS(1) is always great to have. They are also a bit faster than regular Dwarf infantry and that may catch some people off guard. They don't have the best armor, however. It can be used against them, especially when caught in the open. Ranger Captain - his main role is to keep his Rangers in line but he can also add a few more attacks, either at range or in melee. As the units he is a very good, flexible hero. 5 Sharpshooters - longer ranger shooters, less mobile but Piercing (2) would ensure they are going to inflict damage. Very nice addition, may keep some units in check. But similarly to war engines and other troops of shooters, they are quite fragile in melee. Although one does not triple the number of attacks against them and Defense 5+ is definitely an asset! 2 x 10 Berserker Brock Riders - the hammer of the army, Brock Riders have a huge number of attacks. Their efficiency may be a bit limited due to 4+ to hit but then again, they are Vicious! Thunderous Charge (1) does not sound like much for a cavalry but the addition of Pathfinder on one unit and Brew of Strength on the other makes them really dangerous. These units are my priority no matter what. They have enough hitting power to destroy any of my units on the charge. They seem to be easier to damage but their very high nerve makes up for it. It is a very unique and very good unit and no wonder they are so popular among Dwarf players. Berserker Lord - apart from the obvious fact he is there to inspire the Riders, he can be a very good weapon on his own. With the speed and considerable number of attacks as well as huge maneuverability of an individual, he can pin down fliers, attack elements that are not easily reached by the units and help friendly regiments if needed. 6 Earth Elementals - If Brock Riders are the Hammer then Elementals are obviously the Anvil. Another unit that cannot be wavered, very resilient with Defense 6+ and can still inflict damage in melee. Especially, when the enemy is not careful and allows them to surge! They obviously need quite an overwhelming force to be brought down so I will be looking for any openings to flank charge them or attack with many units at the same time. 2 x Greater Elementals - whatever is said about Elementals, Greater ones do it at least as good. They are even more dangerous in melee with their Crushing Strength (3) and can get to the flanks easier due to smaller foot print. They are harder to eliminate because fewer units can attack them. I wanted to use the fact they are slow against them. I may try to avoid them, especially at the beginning. And then I will also try to break their formation as when they present a unified line it will be very difficult to break that brick. 2 x Flame Belcher - these war engines complement the army in a great way. They will follow the Earth Elementals wall and protect their back. Even with Surge it is possible to sneak behind the lines and charge from such preferable direction. But Flame Belchers, with their 16" effective range, will be very dangerous indeed. At the same time, when the moment is right, they can obliterate the units in front of them, allowing the Elementals to Surge to finish the survivors. I will be looking for an opportunity to get rid of them before they can shoot at my units. Easier said than done, of course! Stone Priest - very helpful if you want to get the most out of the Elementals. He inspires them, can Surge them and with Bane Chant, these attacks will count a lot. I mentioned I like this army a lot and the reason is it has quite nice elements here, that cover different angles. You have solid center, able to hold and return attacks alike. There is a good amount of various ranged attacks, either to soften up the enemy or to finish it off. There is also a very good melee potential, either in terms of attrition war or typical cavalry charges. However, this army may be a bit more predictable in terms of deployment. Because the heroes can inspire only certain units, one can easier guess where they are going to be deployed. Once you see Elementals positioned, you can expect Greater Elementals, Flame Belchers and Stone Priest nearby. Once one unit of Rangers is deployed, the second one most likely will be next to it. Same with Brock Riders. It does not mean it will be easier to destroy them but being able to predict the formation may help. My general approach to try and defeat that army would be to isolate the three main groups and to eliminate Brock Riders and Shooters first. If I can do it fast enough and with not heavy casualties, then I should have enough resources to surround the Elementals and get the multiple charges. We got Dominate! as the scenario. I won the roll off and picked North. Dominate! seems like a very good scenario for the Dwarfs. They can move their solid center to the middle of the battle field and park there. In the meantime, their shooters and Brock Riders will guard the flanks and prevent enemy from attacking the Elementals from the sides. I decided to try and counter that with my own shooting center, using the wheat field as a good defensive position. The units there would have good shooting position and could also move to add their numbers for the purpose of the scenario objective. Expecting Riders on one flank I wanted to use my own, faster cavalry to engage them. With more units I hoped to win that difficult battle and if I had the survivors in good shape then they would be able to turn towards the center and attack from a much better direction. Last but not least I wanted to have a small contingent on the opposite flank. 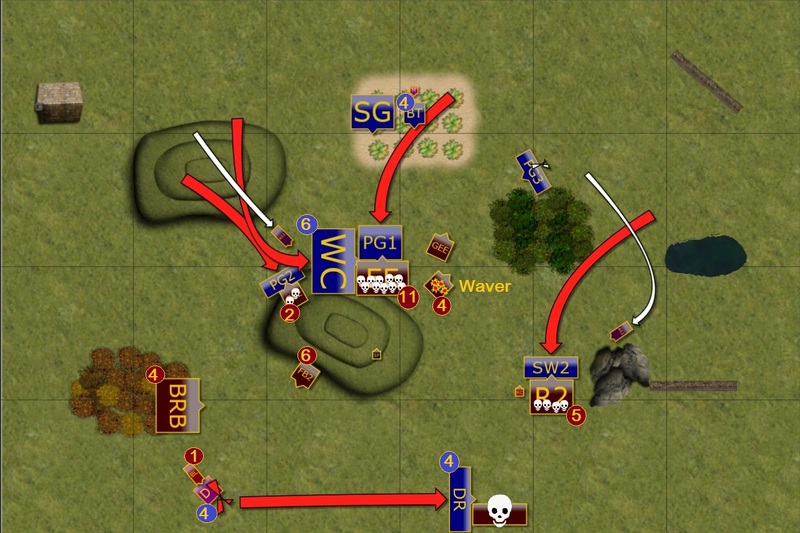 Simply to try and outflank the enemy from both sides and keep them busy. Otherwise I would need to deal with the enemy army on a more narrow frontage, something that is more advantageous for Dwarfs. I won another roll off and decided to take first turn because first, I saw the opening on the flank and second, I wanted to start a shooting duel. The Elves started with a sweeping outflanking maneuver and the fliers all landed on the enemy flank. In addition, the units moved to threaten the Brock riders from the front. They were a little shy, however, and tried to stay out of reach of the flame belcher at the same time. In the middle, fast cavalry and Bolt Thrower all aimed at the Rangers and managed to waver them. Not too bad for the opening shots! The Dwarfs wanted to show Elves how the shooting is done and destroyed one silver breeze cavalry as well as wavered the crew of a Bolt Thrower! While the main central group advanced to secure the center, the Brock riders prepared for impact. Drakon Riders and Storm Wind Cavalry charge into the forest and their combined attacks rout one regiment of Brock Riders. 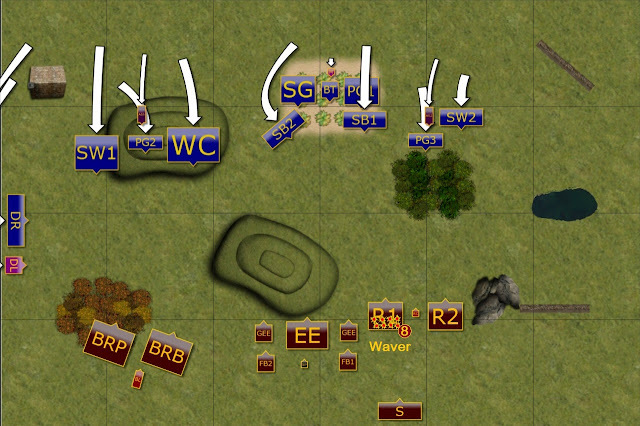 However, the second wave of Elven units hesitated and didn't move into range to help against the second regiment. The shooters finished the job and one of the units of Rangers finally perished. Brock Riders and their Lord had no other option but to attack. The conditions were not perfect due to hindered charge in the forest. However. they managed to destroy Elven knights regardless! The units in the middle started dividing to address different threats. Flame belcher on the left finally acquired some targets and unleashed at the War Chariots, wavering them! Next, second unit of silver breeze was targeted but dwarven shooters and was also wavered! Elves try to adapt to a new situation. The unexpected loss of the heavy cavalry on the flank and separation of forces there, forced Elves to adopt a new plan. Drakon Riders and the Lord flew over the Brock Riders and risked being shot at in order to attack new, more vulnerable targets. In the meantime, the rest of the army re-positioned too. The shooters tried to eliminate one Flame Belcher but despite significant amount of damage, stubborn Dwarven crew refused to give up. The formation in the center continued to spread. Flame belchers acquired new targets and while one destroyed remaining fast cavalry, the remaining one could not stop the Drakons. Thus the Brock Rider Lord took the matters in his hands. However, he chose a personal combat against Elven commander instead. Elves attack on all fronts. Elves could not wait any longer if they wanted to strike first. Some good opportunities presented itself and Elven units tried to coordinate the efforts. On the left flank, Palace Guard distracted Greater Earth Elemental in order to allow War Chariots and Palace Guard Regiment to attack the Horde of Elementals. The damage was significant but the Earth Elementals were not so easy to get rid of! On the far right flank the Drakons destroyed the Sharpshooters and reformed to threaten the exposed rear of the Dwarven formation. While the Rangers were being engaged by the Storm Wind cavalry from the front, to distract them. Sea Guard and Bolt Thrower helped their companions who committed to melee and wavered one of the Flame Belchers. 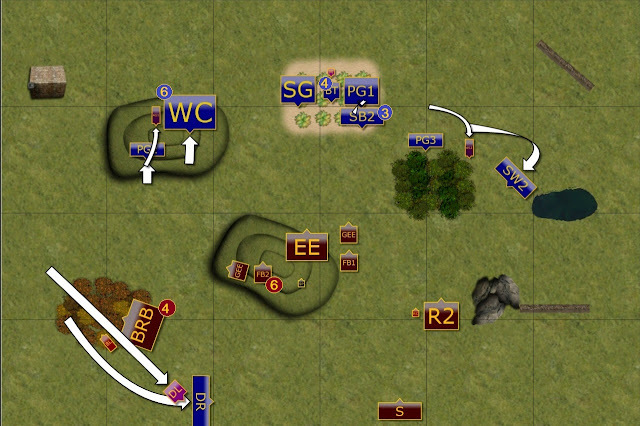 Quite a good sequence of the attacks but would have that impressed Dwarfs? The Dwarfs were still a very dangerous foe and it was an illusion that they may have lost the initiative in the battle. They had to adapt to the situation, though. The Brock Rider Lord had another round of combat in his personal duel and this time the Elven commander suffered badly. The Greater Elemental on the same flank moved away to make some room for the cavalry charge of Brock Riders who destroyed the War Chariots. Elementals also carried the fight to the enemy but their attacks didn't bring the expected results. Another Greater Elemental engaged the Palace Guard in order to stop them from joining the fight in the center. So did the Rangers who wavered a small troop of Elven Knights. Unfortunately for Dwarfs, and luckily for Elves, the Drakon Riders survived another round of shooting from the Flame Belcher. Brock Riders had to make a tough choice and decided to reform to face potential attack from Drakons. That meant they had to expose the rear to the Palace Guard, who now was charging in. Even stubborn Berserkers could not hold in a such difficult circumstances and they perished. In the meantime, Drakons picked another exposed unit, the Rangers, and reformed towards the center where Elven infantry was fighting against the Elementals. This time both Guard units broke the thick wall of the Earth Elementals. Dwarfs do not give up! Although the most recent attack was a heavy blow to the Dwarven forces, the stubborn warriors simply didn't know when to give up. And they were right not to do so as they still had means to carry the fight to the enemy. Flame Belchers simply roasted Palace Guard regiment while one of the troops was defeated by the Greater Earth Elemental. The Brock Rider Lord kept fighting against the Elven commander but this time the Elf kept his guard high. Last but not least, the Ranger Captain held the flank all by himself against the Drakons! Flame Belchers are finally gone! Both armies were quite bloodied at the moment but the fight was far from over. Palace Guard and Sea Guard charged one Flame Belcher each and got rid of them at last! Drakon Riders attacked the Captain but somehow he was only wavered! Spotting the opportunity to reclaim the control over the center to the battle field, Dwarfs mustered their remaining units. Both Greater Elementals charged the Sea Guard, with the very important assistance of the Stone Priest, who invigorated one of the monsters with his Earth Magic. With such a brutal and coordinated attack, Elves had no chance to hold. Also Brock Rider Lord decided it is time to help the army instead of seeking personal glory and attacked the exposed flank of the Palace Guard. But they manged to hold their ground! On the right flank, Ranger Captain reached for the bottle of the finest Ale and emptied it in no time. The magic of the liquor invigorated him immediately, he lifted his ax and charged against badly wounded Drakons. This time they perished for good! Last chance for Elves to reclaim the control. Elves were given one more opportunity to swing the balance to their favor. Palace Guard and Storm Wind charged one of the Greater Elementals and their combined effort was a success as it crumbled down. The brave Ranger Captain met his end too, when a well placed bolt from the Bolt Thrower hit him. But the last word belonged to Dwarfs! The Brock Rider Lord had the last chance to catch Elven commander and this time he did it! Also the Greater Elemental ignored the enemy Army Standard and attacked nearby Knights. They could not hold either, especially after sustaining some damage eariler. Thus the bloody battle came to an end but is there a victor to be declared? The Dwarfs had the lead but could not make it more than 10% of the worth of the army so it was a Draw! Also in terms of attrition points! Many thanks to Eastern Barbarian for a great game and being patient with me when I was grumpy as a Dwarf after losing that Storm Wind regiment turn 2! :D Yet another bloody battle, with 75% of each army dead! But it was only thanks to turn 7 that I managed to save the draw. By the end of turn 6 Eastern Barbarian was controlling the center. I really like his army and I think that with more practice he will do even better. Considering some mistakes on his part he recovered nicely and had the control over the center, even with some hard attacks coming his way. There were many moments that contributed to the overall result so let me go through those I noticed. 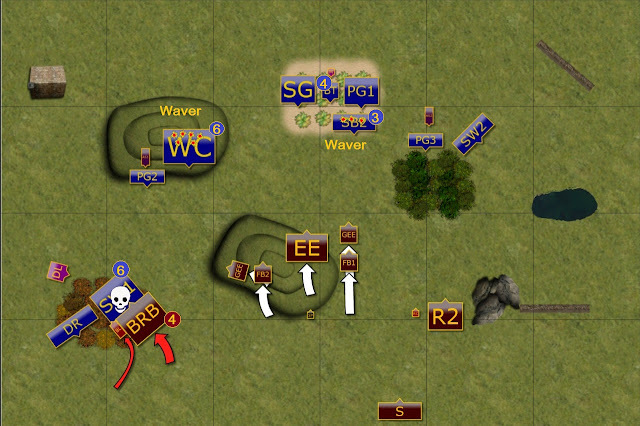 I took the first turn in order to shoot at EB's rangers and hopefully rout them, as they were still in the open. At the same time I noticed he left the landing zone on the left flank I wanted to exploit. However, I wonder if I was not too impatient here. While I forced his Brock Riders to hold and reform and wavered his Rangers, I also exposed my fast cavalry and still had to charge the Riders from the front. In fact, I think EB could have pulled them back and simply use the forest to block the line of sight, thus avoiding being charged. The loss of heavy cavalry in the forest was not expected. EB had to roll 10+ with a re-roll to rout them but I should have been prepared. I simply didn't move chariots or Palace Guard close enough to help if that happened. I was trying to avoid Flame Belcher but it was clear I could not so I should have pressed forward anyway. Instead I flew over and this is also were I was lucky. Flame Belcher didn't stop the Drakons and I could use them to harass the Dwarfs behind the mainline. EB should have charged the drakons, in my opinion, because the Lord was not facing the right direction and was too far anyway. In his turn 3 he moved the center forward but I think he could have held the ground there and tighten the formation. 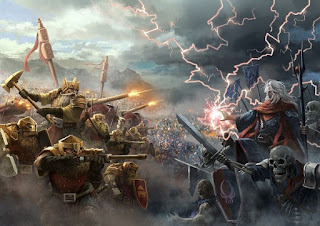 With Greater Elementals guarding the flank of the horde and Flame Belchers to be able to reach different units, he would have not exposed the side of the Horde and allowed Palace Guard to attack from the front. Of course when you leave the enemy intact they can still jump to the control zone in the last turn when you have no time to harm them so maybe holding the ground was not the best option either. My Drakons survived for quite a long time and provided much needed distraction so I was very happy they helped to collect some points. I just wonder if I should have not attacked the Captain with Storm Wind anyway, just to make sure he is gone. Not only I would have saved the Drakons but would have been in a better position to help in the center. I also kept my other flank in hiding unnecessarily. I should move the Palace Guard into the forest and threaten the flank of the enemy. If they were shot at then fast cavalry would have not died. Same with the Storm Wind, the should have moved around that forest earlier to force the enemy to either divide the shots or to allow the center to survive. Bloody. Great report, as ever.